In this tutorial, I’m going to take a quick look at legacy MPC program ‘templates’ – I normally use one for the specific purpose of renumbering the MIDI note assigned to each pad into a ‘chromatic’ order, but here we’ll also look at how we can assign pad MIDI notes not normally available to most MPCs. Currently, this tutorial is only suitable for MPC1000, MPC2500, MPC500, MPC5000 and MPC Software as it uses MPC1000 format PGMs. I’ve been using the “blank.pgm” file a lot as well to control some external gear. Do you offer an MPC1000 program file that will allow me to use my pads to send midi notes below B-0? The reason I need to go lower is simple, bass! Configure your sound module to play the bass patch only when receiving incoming MPC MIDI instructions from MIDI channel 1. However there’s a couple of issues to contend with. Firstly for most MPCs the default pad-to-MIDI note layout is odd to say the least, it’s all over the place – pad A1 is note 37, A2 is note 36, A3 is note 42, and so on, so it’s virtually impossible to play your pads in the same manner as you would a MIDI keyboard (whose keys are assigned MIDI notes in chromatic order – 36, 37, 38 etc). To counter this problem, I created a blank template in all my MPC tutorial books that reorders your pads chromatically. There’s no secret to how this is done – every MPC has always had the ability to renumber the MIDI note assigned to each pad, either directly on the pad itself (in the MPC2000XL for example), or in a dedicated screen, usually PROGRAM > NOTE (F4). The point of using a template is to save yourself a lot of time, as whenever you need your pads in chromatic order (e.g when setting up a multisample program or when controlling an external MIDI instrument), you simply load up your chromatic template. 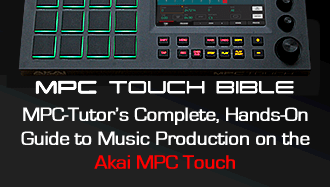 The one I created in my MPC tutorial books was called ‘blank.pgm’. So to fix the odd MIDI note layout, you would simply load this pre-configured ‘BLANK.pgm’ into memory and assign it to the MIDI track we created above – now with that track selected, all your pads will now run in chromatic numerical MIDI note order (please note that this method does not work with MPC3000/2000/60 as these MPCs do not allow you to assign programs to MIDI tracks). That’s fine, but the second problem is that in most MPCs, the lowest note you can set your pads to output is MIDI note 35 (B0). For example in an MPC1000, go to PROGRAM > NOTE (F4) – here you can manually reconfigure the MIDI notes assigned to each pad, but you’ll find that 35 is the lowest you can scroll to. While MIDI note 35 is low enough for most uses, especially for most acoustic instruments, when it comes to bass (especially synth bass), you’ll often want to go even lower, as most synths and sound modules will allow you to trigger notes as low as MIDI note 0 (C-2). Luckily in Richard’s case there is a fix for him. The MPC5000 actually lets you assign MIDI notes as low as C-2 to any pad, and it exports in MPC1000 format – and thankfully, the resulting MIDI note assignments are remembered when the program is loaded (and subsequently resaved) in the MPC1000. I have an MPC5000, so, here it is – chromatic0.pgm. It starts on MIDI note 0 (C-2) on pad A1 and runs chromatically up to pad D16 (MIDI note 63). Remember that this is a standard DRUM program. The MPC5000 has keygroup programs which already handle the chromatic reordering, however the lowest note you can trigger with your pads is note 36 (on pad A1), so this template is also useful for MPC5000 owners. It cannot be used in JJOS2 nor JJOSXL because both these operating systems override any MIDI note re-ordering that may exist in a PGM file (your pads are already chromic though – but you are stuck at a lowest note of 36). Also remember that this specific program template is all about playing low MIDI notes from your pads – if you use a MIDI control keyboard to play through your MPC (MIDI OUT of keyboard into MIDI IN of MPC), then there’s no need to use this program at all. This chromatic program template can be used to trigger internal MPC samples as well – as part of a multisample program. While the MPC5000 and JJOS2/XL already have built in support for keygroup programs that are made to specifically handle multisamples, this template is perfect for multisample set up in all other MPCs. I have also included two other chromatic templates in the zip archive for this tutorial – chromatic35 and chromatic36, which as the names suggest, start at pad A1 on MIDI note 35 or 36 respectively (choose whichever one you prefer), and are more suited to general multisample programs where higher MIDI notes are required (e.g piano, acoustic guitar etc). These are the basic templates I’ve used in my legacy MPC multisample packs over at MPC-Samples.com. 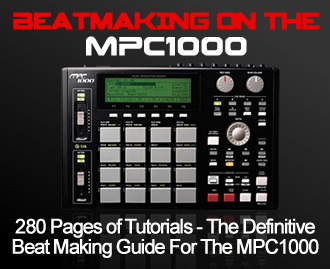 If you want to learn how to multisample in a legacy MPC, I cover this in detail in my ‘Beat Making on the MPC‘ books. One other thing to remember is that you don’t have to stop at just renumbering the MIDI notes on the pads. You can add other parameters that you often require assigned across all pads, such as having a specific attack or decay setting, or specific tunings on certain pads, or having each pad set to NOTE ON etc. Once set up, save it as a template. Anyway, hopefully this template will be of use to some of you out there – and remember it can be used to trigger any external MIDI sound source, including VST instruments within a DAW (set up for this is covered in my MPC-DAW books). But ultimately if you want to play sound modules and VSTi’s through your MPC, often using a MIDI keyboard can be the easiest option! I was wondering if you could help me with an AKAI MPC 2500. I would like to set the MIDI mode to 1A instead of OFF (as default). Is there a way that I could program it in such a way that when I start my mpc, the default mode is MIDI: A1? Don’t think there’s anything in the OS. You could however create a ‘template’ blank project which you either manually load up after boot up, or set up as an AUTOLOAD folder. How did you go about creating these programs? Looking to create multiple programs in different keys or different scales. Is it a case of making a new .pgm and manually scrolling through and setting the notes in the desired scale? Yes, although not all MPCs support this (e.g. MPC Software – you’ll have to manually edit the XPM file in a text editor), and some that do are not able to support notes outside of a specific MIDI note range. Does this work on the MPC X/Live?